HARI is pleased to announce the 2017-2018 Nasir Jones Hiphop Fellows: Martha Diaz and Kareem Jackson a.k.a. Tef Poe. Martha Diaz is an award-winning media producer, social entrepreneur, archivist, curator, and educator. For twenty-five years, Diaz has traversed between the hip-hop entertainment industry, public sector, and academia. 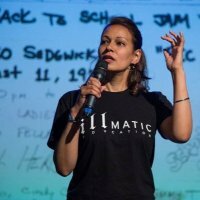 In 2010, Diaz formed the Hip-Hop Education Center to cultivate and formalize the field of hip-hop-based education. She has published research papers on hip-hop education and is co-editor of the Hip-Hop Education Guidebook, Vol. I (Hip-Hop Association, 2007) and Rebel Music: Resistance Through Hip-Hop and Punk (Information Age Publishing, 2015). Diaz has served as a fellow at the NYU Reynolds Program for Social Entrepreneurship, fellow at the Lemelson Center for the Study of Invention and Innovation – National Museum of American History, resident curator/scholar at the Schomburg Center for Research in Black Culture, and Columbia University Community Scholar. Her latest archive/documentary project is the Untitled, Tupac Shakur Documentary, directed by Steve McQueen. From public housing to the Silicon Valley and Harvard University, how did Nasir Jones, better known as Nas, become the celebrated rap artist and icon he is today? The Time Is Illmatic Project will delve into Nasir’s history through small study groups that will introduce students for the first time to a digital humanities curriculum. Using media clips of the movie, never before seen interview footage from hip-hop luminaries, and other primary and secondary sources aggregated from the Internet and hip-hop archives, I will examine Nasir’s life, musical journey, and legacy to understand his family background, upbringing, influences, and most important his skills and talents. Students will explore themes such as housing projects, gun violence, trauma, the school-to-prison pipeline, and the role of music and the arts. The main goal of the pilot project is to obtain feedback from the participants to make improvements on the curriculum before it is introduced to the public. Building on the Center’s Jones collection, I will also archive the cultural material and media assets of the movie. Tef Poe is an American rapper, musician, and activist. He is one of the co-founders of the Hands Up United movement. Tef has consistently advocated for grass-roots movements in racial justice within and outside the United States. In his art and activism, he insists on the value of local people taking charge of conversations about their own communities rather than relying on national organizations. We are now poised with an opportunity to fully confront the inequalities of this country. Black Americans worked together as a collective to protect the Obama Administration’s credibility. For the next four years, we will bear witness to a presidential administration that could care less about the energy we have invested. The cultural connections between hip hop and black resistance will never fade away. When protests and mobilizations don't work, we must learn to use music concerts as a resistance tool. Learn more about the Nasir Jones Hiphop Fellowship here.